One can always tell when it’s Oscar season because theaters get flooded with indulgent, two-and-a-half-hour epic historical biopics with little more to offer other than a few brilliant performances. Which brings us to Darkest Hour. 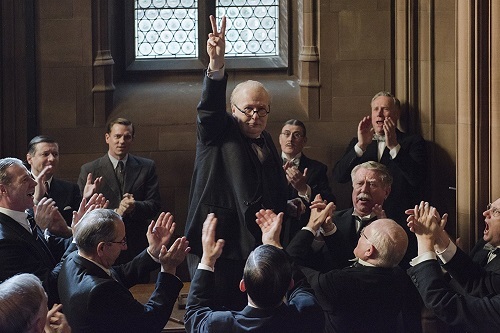 Darkest Hour begins with the appointment of Winston Churchill (Gary Oldman from Tinker Tailor Soldier Spy) as Prime Minister of Great Britain by King George VI (Rogue One‘s Ben Mendelsohn). Britain is in the middle of World War II, and German armies have stormed through France and left hundreds of thousands of soldiers, both British and French, stranded on the beach at Dunkirk, just waiting to be crushed. While Churchill puts together a plan of escape for the troops on the ground, he struggles with the very real possibility that he may have to engage in surrender talks with Hitler. 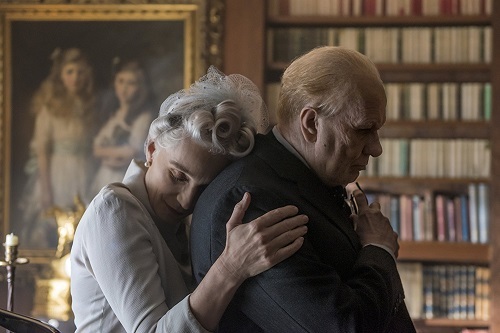 Written by Anthony McCarten (The Theory of Everything) and directed by Joe Wright (Hanna, Anna Karenina), Darkest Hour is exactly the movie that one would expect it to be. It’s long, slow, and drawn out, with very little in the way of a payoff. There are a handful of compelling scenes, but those mostly just show off how well Gary Oldman can carry a movie. As a biopic, it’s very tired. And, even more unforgivably, Darkest Hour wastes the talented Lily James (Baby Driver, The Exception) in a glorified sounding board role. It’s a shame. You know those movies that tell you half a story, and you think to yourself, “I wish I could see the other half of that story.” That’s Darkest Hour. Luckily, in this case, you can see that other half of the story in Dunkirk. And Dunkirk is a much better movie. If there’s a good reason to see Darkest Hour, it’s the performance of Gary Oldman. 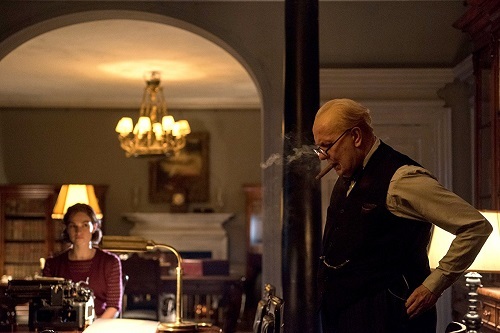 Oldman owns the role and seems to literally transform into Winston Churchill before the audience’s eyes – even knowing it’s him, it’s tough to see his face within the character until about halfway through the movie. Some of the physical metamorphosis is due to clever costuming and makeup, with Oldman donning a fat suit and subjecting himself to a head full of facial prosthetics, but that’s just the look. As with Anthony Hopkins a few years back in Hitchcock, the makeup helps with the aesthetic vision of the character. Oldman does the rest, though, channeling Churchill and delivering note-perfect versions of both his famous speeches and his casual conversations. With Darkest Hour, Gary Oldman isn’t given much to work with, but he makes the most out of his opportunity to portray a legendary historical figure.